Working on revisions again -- still. And I thought I'd share one technique I use to weave in specific imagery and create a particular mood for the reader. 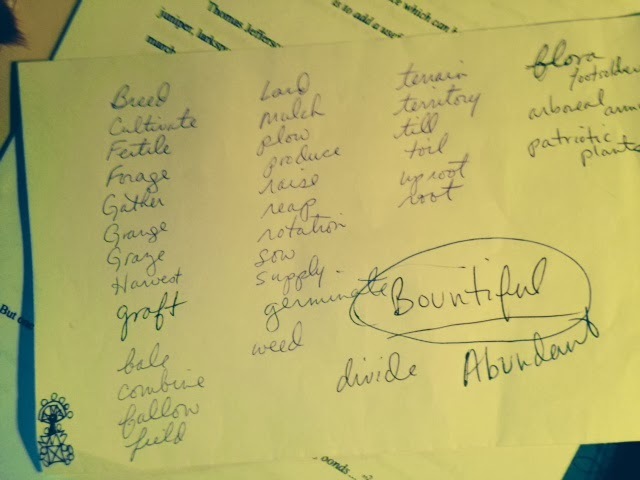 It's just a list of words, in this case, agricultural words that I might use to reflect the point I am trying to make, namely that Jefferson grew a nation. You can be fancy and call it an image system, 'cause it's the same thing - a list. I won't use every word on the list. That would be overkill. The list just reminds me of what I can do if I find myself using dull words like use, sent, or did. Instead, TJ can harness, or scatter, or cultivate.... My mother used to do this when she wrote poetry, and I'm still finding pages with word lists on them. Sometimes I can tell which project she was working on by the words - creepy, crawly words for the Big Bug Book, holey words for a poem about animals that dig. Exercise: Make your own word list for the project you're working on now. Think of the connections you want to make. What is your subject matter? Use a thesaurus to get you started, but don't stop there. Go heavy on verbs because they carry the action and will be most useful. You'll reap a more vivid text that blooms with multiple layers of meaning. Writing a Biography -- How do I start? 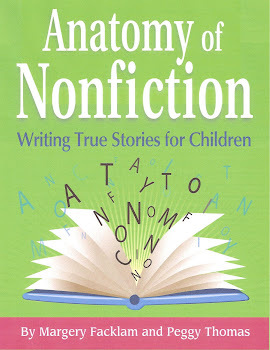 Just the other day someone asked me about writing biographies. "How do I start?" I'm always perplexed by such a question because if you know you want to write a biography, you must have already started. I can't imagine choosing the general genre before choosing a person to write about. It's like planning the wedding before you meet the guy. The first thing you have to do is fall in love (or at least become infatuated with) a character. And usually the subject of a gotta-read biography has character -- faults and ambitions, temperament and talent, a singular drive or a mass of contradictions -- something that makes her stand out. Think of Thomas Jefferson's bipolar emancipator on paper/slave holder lifestyle. Shirley Chisholm's ramrod opinions. Einstein the sock-less daydreamer. Above all, the person has to act. Just like a novel, a biography has to move. And usually it is this action that initially draws you to a subject. For example, Homan Walsh flew a kite over the Niagara River that started the bridge to Canada. But it is his character that drives the story in The Kite that Bridged Two Nations by Alexis O'Neil. But a great act doesn't always signal a great biography. I've come across a lot of acts in history that sounded like it would make a good story, but either the character wasn't there, or wasn't kid-friendly, or there wasn't enough information to go on. Further research resulted in a dead end. Don't discard those names, though. Those types of leads make a good basis for a fictional story where you can fill in the blanks. Once you've fallen in love. Test the waters. Can you live together? Is this person interesting enough to spend months, years with? Will you begrudge him for taking over your dining room table and spilling onto the floor? How about your family? Will they withstand listening to the constant barrage of boring facts that you find fascinating? If you answered yes, then you've got yourself a new roommate. Now ask yourself if this person is book-worthy. You might be star-struck, but would a kid find it as interesting? Will an editor? Should kids know about this person? This is always a hard question to ask. But if you want to publish through traditional channels it is something you have to look at. Ask: Are there any books already out there? If no, ask why? Maybe your character doesn't fit neatly into a curriculum niche. Editors don't like that because it makes it harder to sell. Maybe the subject matter is inappropriate for a young age. I've had people comment that Shirley Chisholm would be hard to put in a picture book because the politics would be over the reader's heads. Or maybe you've found something truly new to offer. If yes, then ask yourself, "What am I bringing to the table that is different than what is already out there?" This is key. A well-written biography can sit on the shelf a long time. Give the librarian a reason to buy a new title on the same subject. Are you going to include newly discovered information? Can you find a new slant on the subject. 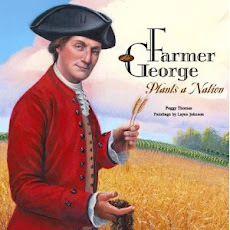 That's what I did with Farmer George Plants A Nation. GW's farming was a new take on a very overdone subject. In order to answer all of these questions, you've had to have done a fair amount of research already, which means you have already started. So you shouldn't be asking me, "How do I start?" You should be writing!